Sherry Potter Cervi attended Marana High School from 1989-1993. 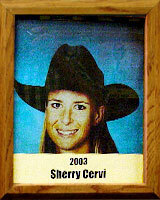 While she lettered in Basketball all four years, and was “All-Conference” in her senior year, Sherry is best known for her Rodeo skills. Each year from 1989-1993, she was recognized as the Arizona High School All-Around Cowgirl and won several individual event titles. As an amateur with the Arizona Junior Rodeo Association, she was an “All-Around” Champion from 1986-1993. She turned professional in 1994 and was the Reserve Champion Barrel Racer. In 1995, she was the World’s Champion Barrel Racer. In 1996, she took 2nd in the world standings. She repeated as Reserve Champion Barrel Racer in 1998. In 1999, as the World’s Champion Barrel Racer, she won more money than any rodeo contestant, male or female. She has won the Barrel Racing competition at the Houston, Texas Rodeo in 1995, 2000, and 2001. This is the biggest Rodeo in the world next to the National Finals in Las Vegas. In 1996 at the Dodge Circuit Finals in Pocatello, Idaho, she won the Coors Shootout in Phoenix twice and has won every major rodeo at least once including rodeos in: Denver; Houston; Austin; San Angelo; Cheyenne; Red Bluff; Clovis; San Francisco; Salinas; Prescott; Phoenix; Redding; Las Vegas; Calgary; and right here at the Tucson Rodeo. One of the highlights in her career was representing the USA at the 2002 Olympics in Salt Lake City. She is one of only three women in Rodeo with career earnings over $1-Million.